Though never really long enough for a decent vacation, a week is a longer time in some Caribbean destinations than others. In the compact BVI, for instance, you can go a lot of places in a week. It’s the same in the Grenadines. In St. Lucia and Martinique, not so much. Anchorages are a little farther apart, the variety of lunch stops and snorkeling destinations is not as great, and there’s a sizeable gap between the islands. 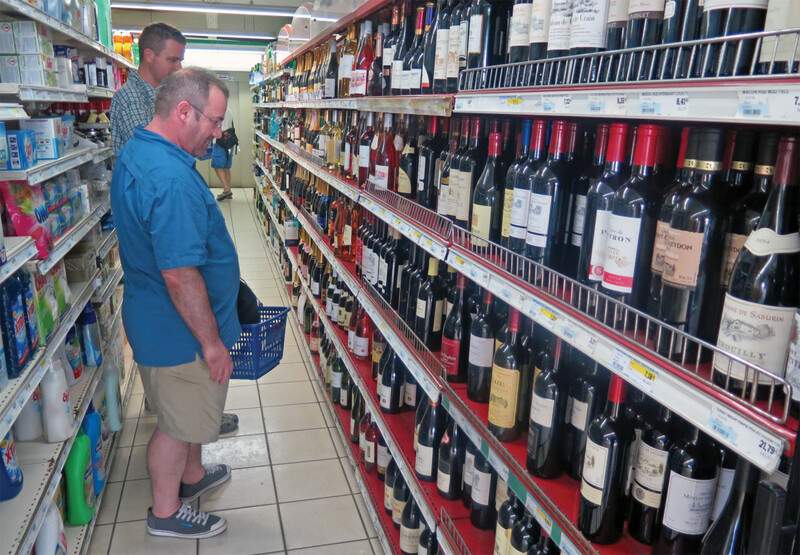 All of which goes a long way toward explaining that after a week sampling the manifold delights of Martinique, and a little taster of St. Lucia, I was left wanting more—much more. 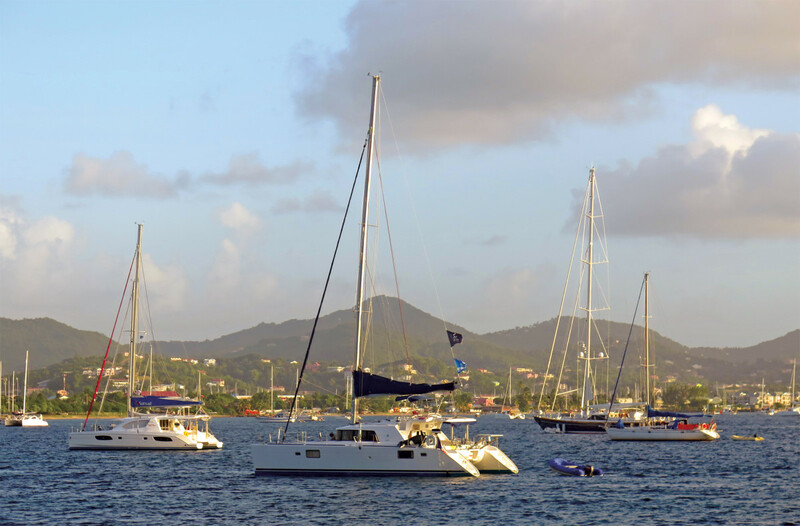 The four of us—Dan, Tim, Nat and me, all presently or formerly of Marblehead, Massachusetts—picked up our Sunsail Leopard 44 catamaran in early December at Rodney Bay Marina on St. Lucia’s northern tip. This is the finish point for the Atlantic Rally for Cruisers, and the fastest of the 200-plus entrants were already docked at the marina when we arrived, with more arriving daily. The bars and restaurants dockside were crowded with bronzed sailors speaking a dozen languages and children ran laughing along the waterfront, noisily relishing the chance to stretch their legs after weeks at sea. The hills of Martinique quickly grew clearer and larger through the sea haze. Late that afternoon we anchored off St. Anne, a small village with reputedly one of the island’s most beautiful beaches. It’s just outside the entrance to Cul de Sac Marin, where a forest of masts marked the hotspot of the sailing scene in the French West Indies. Whether you need to purchase a new boat or refit your old one, replace or repair a rig, sails, engine, refrigerator—whatever, you can have it done there. We were content to go for a walk around the town, then fire up the grill and catch an early night. The soporific effects of sea air, sunshine, a few beers and a gently moving boat always come as a welcome surprise. Along the Island’s south coast, we pointed the bows toward a sheer-sided island in the distance—the famous Diamond Rock, the only island ever to have been commissioned as a warship in England’s Royal Navy. In 1804, with the Napoleonic wars in full swing, the British controlled St. Lucia while the French had a secure foothold on Martinique. The British figured out that a gun battery on Diamond Rock would effectively blockade the southern approaches to Fort De France. Hauling cannon, gunpowder, water and victuals up the rock’s vertical flanks under the noses of the French was obviously all in a day’s work for Jack Tar, and soon the heavily fortified HMS Diamond Rock was blasting away at approaching French ships. When Napoleon heard about this impudent act he was enraged. After all, Martinique was the homeland of Josephine, the love of his life. The impassioned emperor ordered Admiral Villeneuve’s fleet to sail from France to retake the rock—which he duly did, at considerable cost—and to destroy Admiral Lord Nelson’s fleet while he was about it—which he did not, the latter having mistakenly sailed to Trinidad after chasing Villeneuve across the Atlantic. The upshot was that upon his return to France, Villeneuve was ordered to report to Napoleon for punishment, but instead elected to sail down the Spanish coast to take on Nelson at Trafalgar. And we all know how that worked out. Diamond Rock was garrisoned for 18 months—tough duty under the scorching summer sun, we thought as we sailed past a few hundred yards off en route to Grand Anse d’Arlet, one of a pair of picture-postcard bays with gleaming white beaches underscoring the lush backdrop of steep, forested hills and a cobalt sky overhead. We walked over the hill separating the two sleepy villages, having heard that we could clear into the island in the cyber café—which, to the bemusement of the locals, was closed, and remained so until we left the next day. The attempt to clear in would become a recurring theme for the next two days. Still, the scenery was great, the beer was cold, and the ambiance was magnifique. Noon the following day saw us heading north under full sail toward St. Pierre, once a major commercial and cultural center on the island, surrounded by lush plantations and possessed of a thriving port from where rum, sugar, cocoa and spices were shipped back to France. It also had the misfortune to be under the shadow of the dormant volcano that is Mt. Pelée. In the spring of 1902, the volcano awoke from its slumbers. The residents of St. Pierre largely ignored its rumblings, and then on the morning of Ascension Day, May 8, the volcano gave a mighty belch. Its side split open and a giant fireball of superheated gas rolled down over the city, incinerating 30,000 people in a matter of minutes and reducing the city to smoking rubble. There were only two survivors—a convicted murderer in the town jail, and a shoemaker. More than a century later, we saw little evidence of the disaster onshore as we approached the anchorage, but there was plenty on the water. A dozen ships anchored in the harbor were either rolled and sunk by the 1902 blast or burned to the waterline and sank, and we picked our way around the buoys marking the wrecks until we found good holding close to shore in 25ft of water. St. Pierre was a highlight of the week. 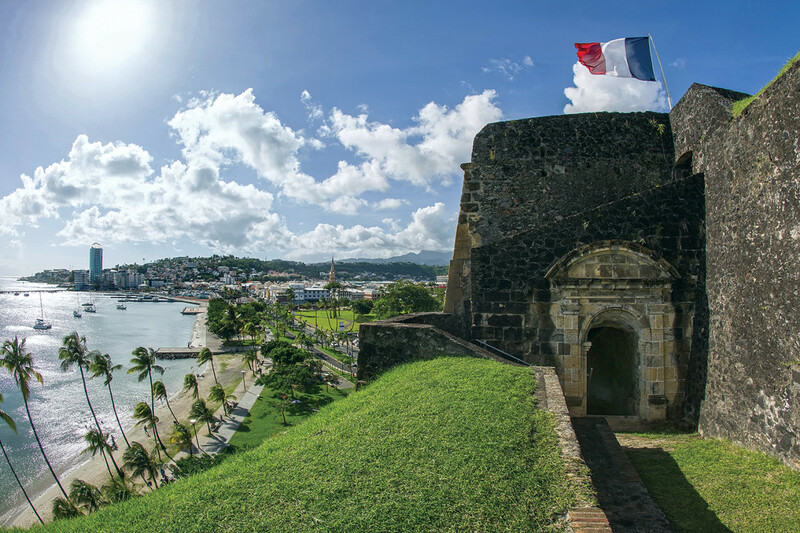 The town was rebuilt on and around the ruins of the old city, though it never recaptured its former importance; commerce and shipped moved to Fort de France in the south. Now St. Pierre is just a pleasant, laid-back town where nothing much seems to happen, and just as well too: Mt. Pelée is still there, its slopes green and pretty, once again fast asleep, but who knows for how long? We finally managed to clear in here, at the local tourist office, where the language barrier succumbed to sign language and schoolboy French, and then visited the nearby museum, a one-room affair filled with poignant reminders of the 1902 catastrophe. Apparently, the governor had bowed to pressure from local merchants not to order the town evacuated because of the commercial implications. Had it proved unnecessary, they’d have called for his head. It was a lose-lose situation for the poor chap. [advertisement]I’ve been to France many times, but Martinique was my first French Caribbean island. Other Windward islands that were formerly British possessions—St. 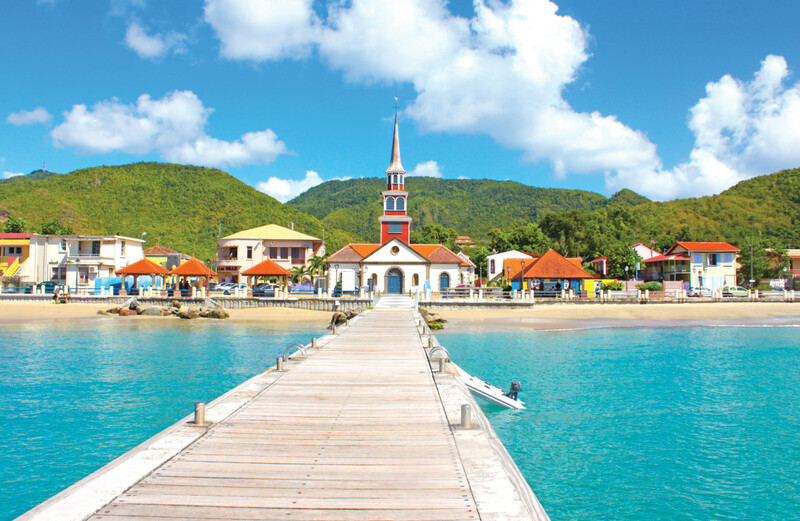 Lucia, St. Vincent, Grenada—got their independence from Great Britain decades ago and are now merely members of the Commonwealth, but Martinique is still a part of France and looks like remaining so. There’s an air of general prosperity here and with it comes a lack of the edginess that’s apparent on some other islands once you get away from the tourist centers. The crime rate is reportedly the lowest in the Caribbean. 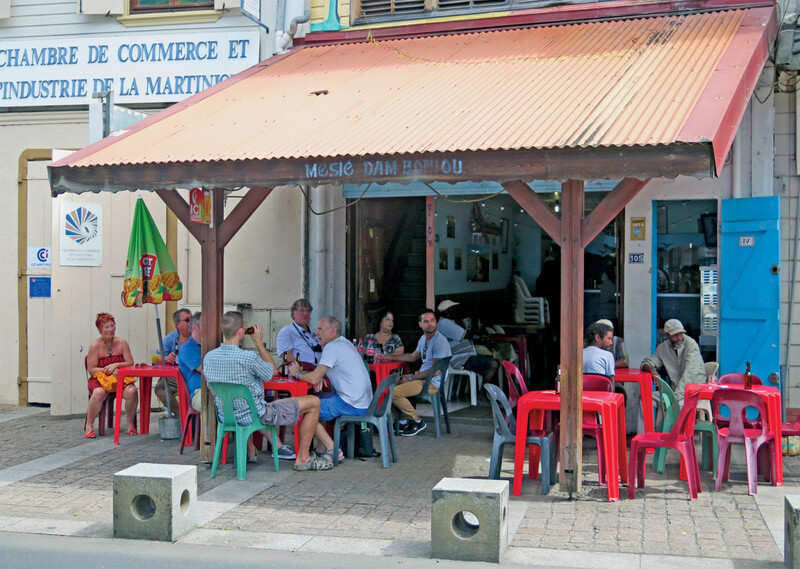 Whatever, we felt relaxed and at home as we strolled St. Pierre’s streets—even more relaxed after a convivial lunch at L’Alsace de Kay, where the host not only plied us with a bottle of the island’s finest rhum agricole but refused to take any money for it. The ensuing glow carried us through another fine evening on the hook and another gourmet barbecue dinner. We set sail as soon as we upped anchor and carried a fine breeze all the way down the coast to the Baie de Fort de France, admiring as we went the lush green hillsides and valleys of this pretty coastline, striped with fields of sugarcane, banana trees and pineapple. The contrast between the dry, often scrubby vegetation of the Leeward islands and the tropical greenery of the Windwards could not have been more vivid. Not that it’s all splendid views; there was the odd glimpse of the industry and infrastructure that makes any inhabited island tick. Fish farms close inshore made it prudent to stay a quarter-mile off. Opting to stay away from the urban delights of Fort de France, we sailed to Anse Mitan on the southern side of the bay and anchored amidst a fleet of sailboats that could been at home in any Mediterranean harbor; Jeanneaus, Beneteaus, Dufours, Jouets, Feelings and a number of nondescript older boats. Some looked like they were being lived on, others had clearly not been sailed in a year or three. Though not unattractive—nothing in Martinique is unattractive, from what I’ve seen—it was not the most beautiful anchorage I’ve ever been to, and we briefly debated heading around the corner to Trois Ilets, which is where Napoleon’s Empress Josephine was born to an impecunious father on a derelict slave plantation. Going ashore, we found internet at one of the many small restaurants and stocked up with pastries and baguettes (of which I’ve never had better, even in France) and wondered again at the Mediterranean feel of the place. We cleared out at Sea Services, a big chandlery near the waterfront—although it turned out that the exit date on the form I’d filled out in St. Pierre was all I needed. That’s what the computer told me, anyway. I had already electronically notified the authorities of our arrival and departure dates, and that’s all that was needed. I have no doubt that in the wrong circumstances officialdom in Martinique could be very officious indeed, but on the basis of my experience, it is pretty relaxed. Five days in the Caribbean, and yet no snorkeling—could this be true? After spending a pleasant night at anchor in Anse a L’Ane, just around the corner from Anse Mitan, we rose early and sailed around to Anse Noire, an indentation in the rigged coastal hills where the book told us we would find a black-sand beach and some good fish-spotting in the shallows. The book got it right. A pleasant hour there was plenty long enough, though, and then we pointed the big cat’s nose south, tucked in a reef and beam-reached back across the channel to St. Lucia at 8 to 9 knots, dropping our anchor off Pigeon Island in Rodney Bay just after noon. Pigeon Island used to be a real island but is now connected to the mainland by a causeway. It is home to one of the biggest naval fortifications in the Windwards, dating back to Napoleonic times. From the fort atop the hill, with Martinique in easy view, the British could keep an eye on French shipping and be ready to dispatch a frigate on short notice. Now it’s a beautiful park with some well-preserved ruins, well worth the $6 admission. Even better, at the foot of the hill lies the Jambe de Bois restaurant, with reasonably priced food, icy beers and excellent internet. [advertisement]We rose early again the next morning and performed the charter boat ritual—refueling and filling the water tanks. A chatty Sunsail dockhand took the wheel as we arrived in the marina, and I watched enviously as he threw the beamy cat around with a dexterity born of long practice. Our fuel bill was impressively small—less than half that of a typical charter, he told us—a testament to the amount of good sailing we’d had. Before long the others were off to the airport—inconveniently located a two-hour drive south along St Lucia’s winding, mountainous roads—and I was left on my own, sipping a beer at the marina bar, reading the guide book once again and thinking about the anchorages we hadn’t visited, the places we hadn’t been. I’d have loved a few more days to explore the interior of Martinique, sail to the windward coast (which is more protected than on most islands) and to check out some more of St. Lucia. But as with all great experiences, it never hurts to leave something undone to give you a reason to go back. 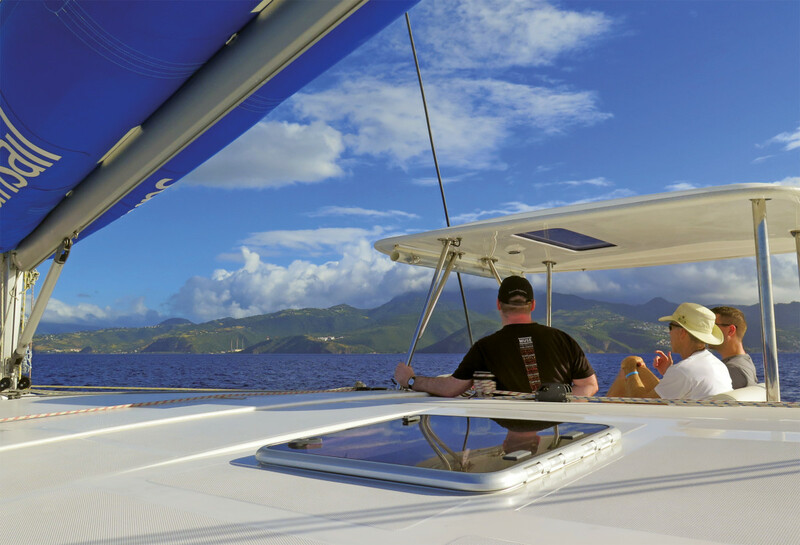 We chartered our four-cabin, four-head Leopard 44 from Sunsail (sunsail.com) which keeps a fleet in Rodney Bay Marina. The Moorings (moorings.com) also has boats there. 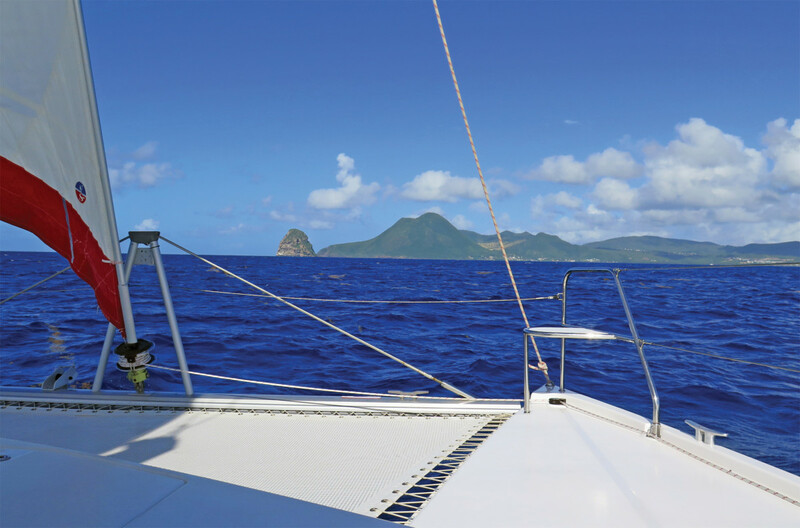 On Martinique itself, Cosmos Yachting (cosmosyachting.com) and Dream Yacht Charter (dreamyachtcharter.com) have southern bases.